Volunteer from the Global Xchange Programme has arranged a discussion session on the street children issues in Bangladesh in a MacKay’s Hotel, Caithness, Scotland on the 26th November. Two hour-long program-featured speeches of the guests, presentation on development issues with the special emphasize on street children. 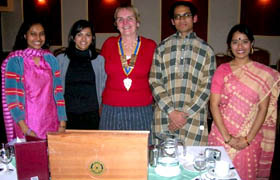 All the members of the Rotary Club were present in the discussion session. Tahrima Khan Tonni, Sejal Vora, Bilkis Rumman Ety, and Muhhammad Umar Khaiyam have done some resourceful presentation, which stroke all the audience. The main aim of the discussion was to promote a platform for co-operation between the Global Xchange volunteer and the local community. It was also an attempt to share information on community development issues and to create a bridge between Chittagong and Caithness. The discussion thus provides an occasion to foster closer co-operation and better understanding on the community development issues. All the participants have shown sheer enthusiasm to contribute for the street children in Bangladesh. After the discussion volunteers have arranged a raffle draw to raise fund for the street children. Wholehearted participation of the rotary Club members inspire the volunteers to take more initiative of fundraising on this issue. The discussion was presided over by Jan Banks, the president of the Wick Rotary Club.